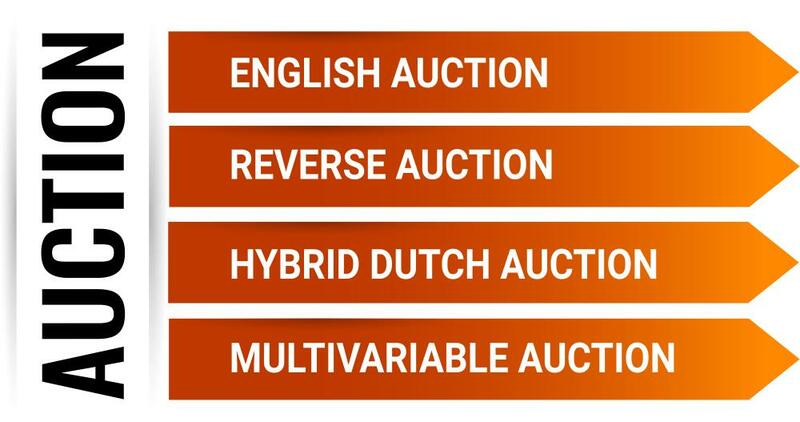 We have expertise in development of different types of auctions: Reverse, Multivariable, English, and Combined (based on Dutch) auctions. 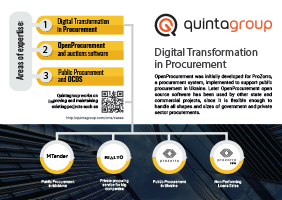 e-Auction module is one of the OpenProcurement toolkit components, developed to hold various types of auctions as it is required in corresponding e-procurement projects. 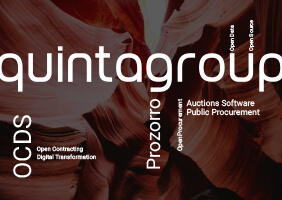 Quintagroup has implemented e-Auction module to carry out four types of auctions as parts of ProZorro and ProZorro.sale projects so far. 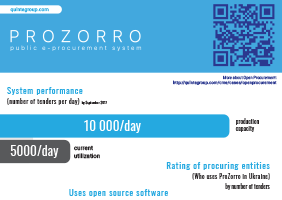 Thus, the ProZorro e-procurement project includes two types of them, such as Reverse auction and Multivariable auction, while the other two, realised within the ProZorro.sale project, are English auction and Combined auction, based on Dutch auction. enhancement of the procurement process. After the start of the auction system pauses for 5 minutes so that participants can get acquainted with bids of anonymous competitors. Once the 5 minutes period ends the system automatically announces the first round. Auction consists of three rounds with identical rules. In each round during 2 minutes each bidder (in order from the higher initial bid to the lower one, or from later bid proposals to earlier ones, if they coincide) can lower their previous bid. If the participant made bid earlier, system will give him the opportunity to make changes before the end of the allotted time. If the participant was inactive for 2 minutes, system will accept his bid and pass the turn to the next participant. When all participants make their bids, system pauses for 2 minutes and announces the next round. After the third round system ranks all submitted bids automatically by price, forming ratings of bidders' positions. This information is published as soon as the electronic reverse auction finishes. Then users can get complete information about bid proposals and participants who submitted them. The eAuction module facilitates running of a 3-stage Multivariable auction, implemented within Energy Services Contracts (ESCO) procedure and based on price plus other factors such as delivery times, service contracts, or negotiable bundles of products and services, during which a participant increases energy service contract performance indicators by no less than one minimal step of its previous value. Each energy service company (ESCO) can make a bid during a tendering period, suggesting the lowest possible price of an energy service contract. Nevertheless, it does not mean that municipality’s benefit will be the highest, since the reduction of energy resources consumption may be minimal due to a small amount of funds invested. Thus, a local government administration should take into consideration several indicators, so that a number of indicators, included into the NPV formula, rather than the lowest price, can be defining. The lowest cost, suggested by an energy service company, is not the awarding criteria, but it is automatically calculated with the NPV formula (net present value), elaborated together with the EBRD, so that the highest benefit for municipality and for state-financed organisations can be achieved. All the ESCOs, participating in a tender, register their offers of efficiency indicators. The numbers are used in the NPV formula to calculate the efficiency indicator. An ESCO that has registered a bid with the highest efficiency indicator, shall become auction winner. A number of indicators may modify the final value of a contract (for instance, warranty maintenance period). Thus, discounted value, modified in accordance with certain indicators, has been introduced. The NPV formula encompasses the initial funds invested and the potential benefit. This feature enables comparing various projects that may differ technically, encouraging ESCOs in this way to apply not only their financial basis but also intellectual and engineering solutions and implement modern technologies andequipment. These indicators are calculated automatically. An English auction, the first one implemented in the ProZorro.sale project, is the most common of the auction formats. It is an ascending dynamic auction, where lots are sold to the bidder, whose bid is the highest one. As a result, state-owned and state-funded organisations may gain considerable benefits, putting for sale insolvent bank property and creditor claim rights. The structure of an English auction is similar to the one of a Reverse auction, though the latter is an descending one. Thus, an English auction consists of three stages where participants can make their bids anonymously. They should increment their bids at least by a minimal step value, particular for each auction. A winner becomes the participant that has registered the highest bid. or the Dutch auction stage finishes. In case no participant makes a bid, tender is automatically announced unsuccessful. All participants that have joined the Dutch auction, except for the one that has made a bid at the first stage, can make a sealed bid that shall exceed the bid, previously made at a 10-minute Sealed bid stage. If no participant makes a bid at the second stage, the one that has made a bid during the Dutch auction stage becomes a winner. A 5-minute Best bid stage goes after the Sealed bid part. All bids, made at the latter, shall be disclosed (while names remain unknown), and the winner of the first stage has an opportunity to increase their bid at the Best bid stage. After the Best bid part a participant that has made the highest bid or the highest sealed bid becomes a winner.